The thing about the Coen Brothers’ movies is, regardless of how much you enjoy them, you probably wouldn’t want to live in their worlds. Fargo, Burn After Reading, Blood Simple — these are movies full of petty people doing horrible things poorly, and whether you’re good, bad, or rapidly oscillating between those poles, odds are things aren’t going to work out for you. 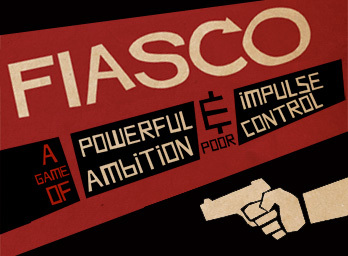 Fiasco, a sort-of-role-playing-game from Bully Pulpit Games, gives you the chance to experience that world for a few hours at a time. Billed as “a game of powerful ambition and poor impulse control,” it casts you and two to four of your friends as the schlubs, low-lifes and ne’er-do-wells whose plans will leave them dead, or wishing they were. And it does it with such ease that you’ll wind up amazed at the way everything fell into place. I say sort-of-role-playing because Fiasco leaves out most of the conventions of RPGs. There are dice, but you’ll only roll them three times total. You never have to make a skill check or factor in your resistance to poison; there’s no dungeon master to tell you what you’ll be encountering. Instead, you just do what the genre’s name implies — you play a role. It’s closer to improv than to traditional gaming, which is, admittedly, an intimidating amount of freedom. If you’ve seen the movies that inspired Fiasco, though, you’ll know just what to do — especially since failure is half the point. The setup is simple. After picking the general setting (outside the main rulebook, there are free downloadable playsets covering everything from Dallas, 1963 to alien invasions and haunted houses), you roll four dice for each person playing. These will be used to establish the relationships between characters and some other basic details, but they don’t spell everything out. You might find out that you and the player to your right are estranged family members, while you’ve had a grudge against the player to your left since the war. Exactly what that grudge is, and how it ties into the other players’ relationships, is up to you to hash out. Once you’ve figured out who you are, players take turns leading two scenes each. You’re given a choice: if you “Establish,” you get to choose who is involved in the scene and what they’re trying to accomplish. If you “Resolve,” you pick whether your character gets what they want. You can’t do both, and because of the game’s mechanics, only half of the scenes will end well for anyone involved. And what’s good for another player is rarely good for you. After two scenes each, the game throws in “the tilt.” This is where things really go bad. You roll the dice again, and determine exactly how things go off the rails. An unexpected death. A frantic chase. A bad plan, carried out perfectly. Whatever the dice say, you work into another two scenes each, leaving room for a brief denouement where you lay out your character’s ultimate fate, or if you’re already dead, how you’ll be remembered. Fiasco isn’t exactly new, kicking around since 2009, but it’s still at the fringes of the gaming world. That’s a shame, because it’s an excellent gateway into role playing. Absent any fiddling with counters or statistical tables, it leaves the focus on storytelling, which is what RPGs are really all about. You’ll be shocked at the richness of the stories you create over the course of a couple hours. One recent playthrough involved suburban hockey rivalries, religious-themed bathroom tile mosaics and a surprisingly touching scene about the nature of respect. That scene ended with someone getting beaten nearly to death in a jail cell, but then, the worlds you make in Fiasco aren’t ones where you’d want to live.